To arrange to have products considered for review, send an email to craigsbookclub@yahoo.com. "When the nocturno pulled out for Cuzco, we slept in separate compartments .... I suppose I was getting old, but it was a dirty racket and the arithmetic was simple: eighty-four divided by two is forty-two, eighty-four divided by one is eighty-four. It's a first: a novel from Hard Case Crime that I didn't particularly like. 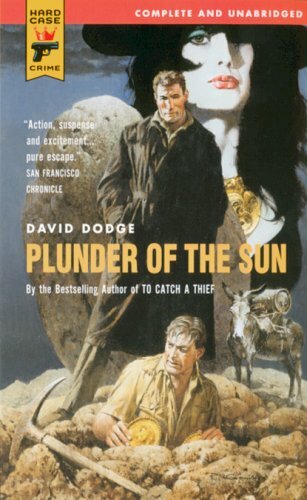 Not that there's anything especially wrong with David Dodge's Plunder of the Sun; I'm just not a big fan of the international-treasure-hunt genre, which actually made it a struggle to get through the book. So much so that I would finish other books in the time between I put this one down and picked it up again. Purely a matter of personal taste, but it does make a difference. Plunder of the Sun is the second of three novels by Dodge starring Mexican-born private detective Al Colby. It was made into a 1953 movie (recently released on DVD), produced by John Wayne(!) and starring Glenn Ford, with only minor plot changes. It was previously adapted for the radio series Escape (and a copy of that show is available for download from this site). The plot, in essence, is fairly simple: Colby, vacationing in Chile (he is fluent in Spanish) is paid a too large a sum of money to ignore, in order to smuggle an unknown package to Peru. (He should have known better, but a thousand dollars is a thousand dollars.) Before long, his client is dead and a cadre of people are trying to get their hands on the mysterious package, which is alleged to contain information leading to an ancient Incan treasure. Can Colby decipher the message and get there first, or will he survive to get there at all? As implied earlier, I didn't give two bits about Colby, his priceless Quechua pergaminos, or any of the losers tripping over themselves to get their hands on whatever lay at the proverbial spot marked X. But I wouldn't say it was Dodge's fault. In fact, it was his way with words, plotting skill, adept characterization (surprisingly enough, the females were especially well-drawn), and detailed setting (the author also wrote travelogues) that actually helped me make it to the end. I liked Dodge's style enough that I would likely try another of his books, as long as it contained a significantly different setup. Apparently, the three Colby books are all similar, so maybe his other series character, accountant James "Whit" Whitney (who has been compared to Nick Charles of The Thin Man), would be more my style. However, given that Plunder of the Sun marks the return in print of any of his books (which is really hard to imagine, given that he also wrote the novel that the Alfred Hitchcock / Cary Grant / Grace Kelly romantic caper To Catch a Thief was based on), that may prove difficult. Click on the links above to purchase any of the books mentioned, or use the search box below to find what you like.